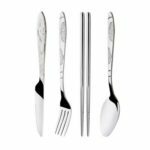 The utensils set is a solid flatware set for someone who needs the basics, which has a proper thickness and weight to hold comfortably. It consists of 2 spoons, 1 knife, and 2 forks. Perfect for daily use, gathering, party, camping, etc. 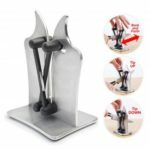 Constructed by high quality rust-resistant stainless steel, durable and healthy for everyday use, dishwasher safe. Mirror finished surface, smooth edge no rough spots, proper gauge thickness and weight to hold comfortably. 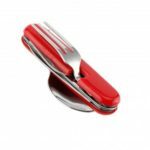 5pcs set including 2 spoons, 1 knife, and 2 forks; perfect for daily use, gathering, parties, camping, or when you need extra flatware set, also a great gift.